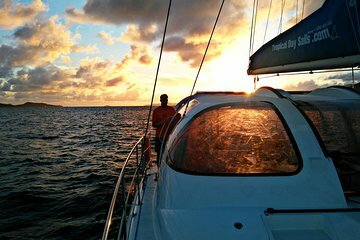 Watch the sunset from the decks of a 40-foot (12-meter) catamaran during this 1.5-hour late afternoon cruise from Virgin Gorda or Tortola. Swim and go snorkeling using the provided snorkel equipment before the sun dips below the horizon. Make your way to the marina nearest to your hotel in Virgin Gorda or Tortola, where you'll board the 40-foot (12-meter) catamaran staffed by an expert crew. Get to know the members of your group as the boat glides out into the ocean. Departure time is 4:30pm in the winter and 5pm in the summer. Begin the cruise with a welcome cocktail of traditional island rum punch. Sail around the area, stopping to swim and snorkel (use of snorkeling equipment included). When the sun starts to set, relax on deck and watch the show. Get dropped off at your original departure point after 1.5 hours.